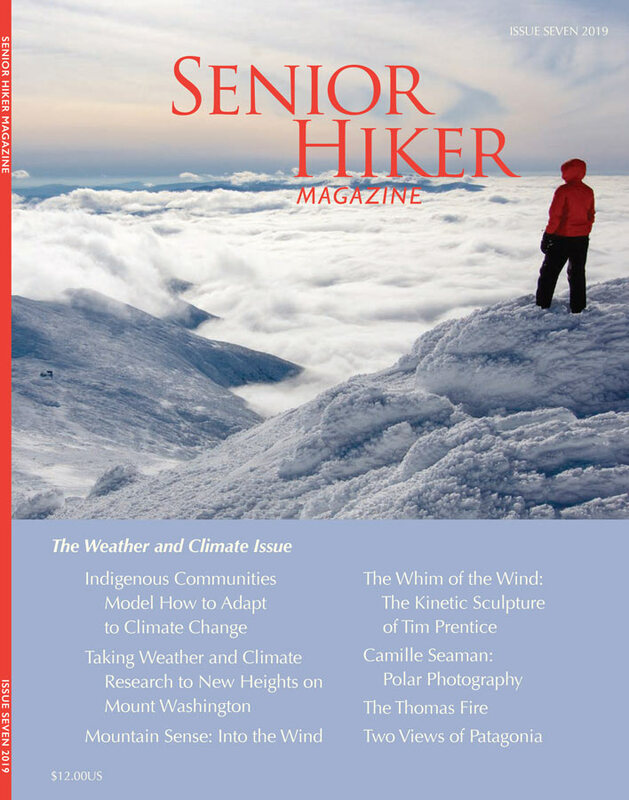 Senior Hiker publishes good writing, compelling science, beautiful photography, and artwork inspired by the wilderness experience. Regular columns include practical guidelines on hiking (Mountain Sense), descriptions of hikes in international locales (Exotic Hikes), hiking group profiles (Hard Corps) and accounts of hiking misadventure (Hell Hikes). An underlying theme informs the content and imagery of each issue, such as wilderness environments, wildlife, and food before, during and after an adventure. The journal is published three times a year by Deer Isle Press, LLC. To read additional articles in the current issue, purchase this issue or subscribe, including the current issue in your subscription. You may also purchase a back issue. Shari Aber taught English in public schools in NYC and Newburgh, NY. Since retiring, she has led paddles and hikes in the area. Shari loves both sports, also downhill skiing, writing, good food, her dog Alice and her family. She is the author of A Kayaker’s Guide to the Hudson River Valley. Marty Basch is author of seven books including 50 Best Hikes in New England. An Explorers Club member, he’s climbed New Hampshire’s 48 four-thousand footers and peaks on the sub-4,000-foot list “52 with a View.” He’s hiked in Greece, Ireland, Chile and China. He is also editor of the Mount Washington Observatory’s magazine Windswept. Basch lives in the White Mountains with his hiking wife Jan.
Bruce Bulger is an artist, illustrator and furniture maker, who enjoys traveling, exploring steep mountainous terrain, and drawing en plein air to tell an accurate pictorial story of being there. Fritz Burke is a writer, husband, father, and carpenter. His essays have been aired on National Public Radio and have appeared in various magazines and newspapers. Fritz is devoted to traveling to warm places to escape the Maine winters. He is currently working on an essay about Cuba. Charlie Cragin practiced law for many years in Maine, chaired the US Board of Veteran Appeals, and served in senior positions at the Department of Defense, a Washington, DC, law firm, and a defense company. Now retired, he divides his time between Raymond, Maine, and Santa Fe, where he hikes with the Santa Fe Chili and Marching Society every Wednesday. Jeff Dworsky is a professional photographer, lobsterfisherman and antique textile dealer who lives in Stonington, Maine, and on the island of Carriacou in the Grenadines. His photographs of people and places frequently appear in such publications as The Island Journal, Downeast Magazine, and National Geographic Traveler. Roberta Forest is a nature photographer who started hiking after retiring from her work as a special needs teacher. She enjoys exploring the natural world on foot and documenting all that she sees. Dan Flores is the author of ten books on western US history, including, most recently, American Serengeti: The Last Big Animals of the Great Plains. A.B. Hammond Professor Emeritus at the University of Montana, he lives just outside Santa Fe, New Mexico. Jeremy Frey is a nationally recognized master basket weaver. His work, which is based on Passamaquoddy traditional methods and materials, is shown in museums, galleries, and collections around the country. He has been awarded best-in-show from both the Santa Fe Indian Market and the Heard Museum Guild Indian Fair and Market in Phoenix. He lives in Eddington, Maine. Freelance writer and photographer Chuck Graham lives in Southern California and appreciates the fact that he can drive to the Carrizo Plain National Monument without encountering a stoplight. His stories and photos have appeared in Backpacker, Outdoor Photographer, National Geographic for Kids, Islands, BBC Wildlife and Canoe & Kayak. chuckgrahamphoto.com; Instagram @chuckgrahamphoto. Jean Hoekwater has been the naturalist for Baxter State Park since 1988. Earlier work with the Quebec Labrador foundation, the Appalachian Mountain Club and as a whitewater guide set her on a lifelong course of enthusiastic adventures in the US and Canada. She lives in Brownville Junction, Maine, with the 100-Mile Wilderness in her backyard. Judith Jerome is a theater artist and writer, and lover of the wild outdoors, transplanted from Texas and Oklahoma—stories from which she can’t stop telling—via Colorado and New York City, to Maine. She was one of the founding directors of Opera House Arts at the Stonington Opera House on Deer Isle, where she has lived for 18 years. Ted Levin has worked as a zoologist at the Bronx Zoo, a naturalist for the National Park Service, and a wildlife biologist for the Audubon Society. He is the author of Backtracking: The Way of the Naturalist; Liquid Land: A Journey Through the Everglades; and most recently, America’s Snake: The Rise and Fall of the Timber Rattlesnake. He lives in eastern Vermont, where he climbs high talus slopes in search of snakes. Rod Lorenz is a retired physician, lifelong hiker and backpacker, and occasional writer in prose and verse. When not hiking he is committed to community service and neighborhood activities. With his wife and son he built an Alaskan cabin that now facilitates visits to grandchildren in the Copper River Basin. He looks forward to his third trip to the Boundary Waters Canoe Area Wilderness in Minnesota this summer. Lalita Malik retired from IBM to pursue her passion for the environment and travel. Since then, she has led Adirondack Mountain Club Adventure Travel trips to national parks in the US, Europe, India and Patagonia, chaired local New York environment councils, and published articles on energy independence and safe hiking. She currently leads hikes for her local chapter and is focused on generating passion for the outdoors in the next generation to build environment stewards of tomorrow. Frank Melia, a lifelong Dubliner, recently retired from a career as administrator for the Dublin City Council. An avid hillwalker since youth, he hikes every weekend, as well as pursuing interests in reading, writing, music and volunteering. A Maine native, Brook Merrow lives in Bozeman, Montana, where she writes and recreates. She has taught language arts/writing at the middle school, high school and college levels. Her work has appeared in Big Sky Journal and Montana Magazine. Brook is happiest when she is moving. Dorcas S. Miller has written a dozen books, including More Backcountry Cooking. She loves to be outdoors—and to eat good food outdoors. Her favorite piece of camp cooking equipment is a food dehydrator; with it, she can prepare at-home recipes on trail. Dorcas was a founder and served as the first president of the Maine Master Naturalist Program, where she still teaches. A second edition of her classic pocket guide Track Finder has just been published. Jessica Rykken is an entomologist currently working for Denali National Park. She has conducted surveys of pollinators and other insects in various national parks over the last dozen years, and is also passionate about outreach and education. She loves exploring high elevations and latitudes on foot. A. H. Saxon is the author of P. T. Barnum: The Legend and the Man, as well as editor of Selected Letters of P. T. Barnum and The Autobiography of Mrs. Tom Thumb. A fellow of the John Simon Guggenheim Memorial Foundation, he has also written fiction and works dealing with natural history, including The Old Codger’s Guide to Hiking and Climbing in the White Mountains: A Vade Mecum for the Old but Young at Heart. Carmin Sherlock is an English and foreign languages major at Scripps College in Southern California. Before college, she spent a year backpacking solo through Europe, New Zealand, and South America, during which she walked the 500-mile Camino de Santiago in northern Spain. Besides traveling, she enjoys backpacking in the American Southwest, writing for her college newspaper, and ballroom dancing. She grew up in Eugene, Oregon. Gary Snyder is a poet, environmental activist, and educator. He has published eighteen books, which are translated into more than twenty languages. In 1975, he received the Pulitzer Prize for Poetry. Sandy Stott writes analyses of search and rescue in the Accidents column for AMC’s journal Appalachia. The founding editor of the Thoreau Farm Trust’s blog, “The Roost,” he writes often about wild lands, their spirit and Thoreau for a variety of publications. His book Critical Hours—Search and Rescue in the White Mountains, released by University Press of New England, is available at bookstores and online.